BUFFALO N.Y. OTIS BEDDING CO. CLASSIC MULTICOLOR GOOSE GRAPHIC ADVERTISING BUTTON. JAMES MORRISON BRASS MFG. CO. LIMITED TORONTO ADVERTISING BUTTON. “BOSTON LEADING CLOTHING, CONTINENTAL CLOTHING HOUSE” EARLY CLOTHING AD BUTTON. “CANADIAN METAL CO. TORONTO” ADVERTISING BUTTON. 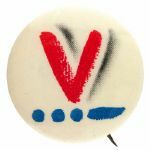 WORLD WAR II GASOLINE SPONSORED “HI-SPEED VICTORY CLUB” LITHO BUTTON. BABY’S BARE BEHIND APPEARS ON CLASSIC CIRCA 1898 CLOTHING ADVERTISING BUTTON. “LANPHER HATS” UNUSUAL DIE-CUT CELLO ADVERTISING BUTTON REVEALS BROWN FELT HAT. “STEPHENSON UNDERWEAR / SOUTH BEND, IND.” CIRCA 1910 ADVERTISING BUTTON. “STEPHENSON UNION SUITS / SOUTH BEND, IND.” CIRCA 1910 COLORFUL ADVERTISING BUTTON. NAKED BOY EARLY CLOTHING AD BUTTON FROM 1896. STEPHENSON UNDERWEAR GRAPHIC AND CLASSIC EARLY ADVERTISING BUTTON. WINCHESTER JUNIOR RIFLE CORPS CIRCA 1915 BUTTON. OLSEN & JOHNSON CARMEL, N.Y. 1950s RARE LOCAL RESTAURANT PROMO BUTTON. SELZ SHOES MAKE YOUR FEET GLAD GRAPHIC HAPPY FEET ADVERTISING BUTTON. HAND COMPUTING DEVICE CIRCA 1900 ADVERTISING BUTTON. LUXTONE BEAUTY SECRET 1930s ADVERTISING COSMETIC MIRROR. CLOTHING BUTTON COLLECTORS PINBACK BUTTON FROM THEIR SECOND SHOW IN 1940. NRA CONSUMER FDR ERA BUTTON FROM 1933. GEO. A. OTIS – WHAT IS HOME WITHOUT A GOOD BED AD BUTTON. LITHOGRAPHY IS AN ART WITH PAINTER’S PALLET GRAPHIC AD BUTTON. HOUSEHOLD OUTFITTING CO. JUNIOR SALESMAN AD BUTTON. FACTS IN A NUT SHELL - SEYBOLD PIANO & ORGAN CO., ELGIN, ILL. GRAPHIC AD BUTTON. G-MAN OR GANGSTER LEAD FIGURE WITH TOMMY GUN AND PISTOL. STATUE OF LIBERTY 1980s BUTTON ISSUED BY BELL TELEPHONE PROMOTING U.S. SAVINGS BONDS. “SEARS CALIFORNIA THRILLER DAYS” GOLDEN BEAR BUTTON WITH ADVERTISING RIBBON. “DR. BELL’S PINE TAR HONEY / CURES COUGHS” BELL SHAPED MEDICAL STICKPIN. R. CRUMB SLOGAN ON PROJECT HEALTH ANTHROPOMORPHIC APPLE BUTTON. “HEALTH CARE FOR PEOPLE NOT PROFIT” EARLY HEALTH CARE ISSUE BUTTON. SHOE WORKER’S PROTECTIVE UNION “3RD ANNUAL REUNION / S.W.P.U. / AUG. 29, 1914” RARE ONE DAY EVENT BUTTON. ASPEN SKI PROMO “DEEP POWDER / PUREST SNOW / MADE IN ASPEN” ENAMEL ON BRASS PIN. “AMERICAN EXPRESS” CIRCA 1930s ADVERTISING BUTTON. “1ST WORLD WAR PHOTOS IN THE BULLETIN” NEWSPAPER BUTTON. “SHERMAN & McCONNELL DRUG CO. / OMAHA” LIKELY FOR 1898 TRANS-MISSISSIPPI EXPO WITH DOSE INDICTOR BUTTON. “WHEN NATURE HALTS ‘THERE’S HOPE’ “ 1930s HOPE LAXATIVE ADVERTISING BUTTON. TEDDY ROOSEVELT “TEDDY’S BEARTHDAY 125 YEARS” LITHO TIN TAB. “PUBLIC POWER” WITH LIGHT BULB GRAPHIC BUTTON. “FREE PUBLIC SCHOOLS” CIRCA 1920 BUTTON OPPOSING CATHOLIC SPONSORED SCHOOLS. “STONE FRENCH STAY” LONDON CORSET MAKER COPPER EARLY ADVERTISING TOKEN. "WALDORF-ASTORIA" FAMED NYC HOTEL SANTA LARGE BUTTON. “YOUR DRUGIST IS MORE THAN A MERCHANT” JOHNSON & JOHNSON EARLY DRUG STORE PROMOTION BUTTON. “GRAND TRUNK” NUMBERED BRASS EMPLOYEE RAILROAD BADGE. “MOORE OIL” HORNED DEVIL EARLY 1900s SILVERED METAL ADVERTISING STICKPIN. “PUBLIC SERVICE COMPANY OF COLORADO” 25 YEAR SERVICE TIE BAR IN ORIGINAL HINGED BOX. “PUT THE WORLD IN YOUR POCKET / HAMMOND” MAP CO. ADVERTISING BUTTON. “MEET ME IN CALIFORNIA. STATES RESTAURANT CHICAGO” EARLY STATE THEMED RESTAURANT BUTTON. “WOMAN’S BENEFIT ASSOCIATION O.T.M./HOME OFFICE BUILDING PORT HURON, MICH.” INSURANCE BUTTON. “K&L OF S” KNIGHTS AND LADIES OF SECURITY MUTUAL BENEFIT ASSOCIATION / LIFE INSURANCE ENAMEL BADGE. “THE PRUDENTIAL – LIFE INSURANCE FOR MEN, WOMEN AND CHILDREN” CLASSIC EARLY ADVERTISING BUTTON. MOST UNUSUAL EARLY 1900s MOTHER OF PEARL PINBACK BUTTON. “THE BALLOON FACTORY ETC” NYC FAMOUS RESTAURANT ADVERTISING BUTTON. "SHIRLEY TEMPLE DOLL BY IDEAL" 1972 PROMOTIONAL BUTTON. SUPERMAN BANK ENDORSEMENT LARGE 1970s BUTTON. “BRITIAN DELIVERS THE GOODS” WITH FLAG WORLD WAR II BUTTON. “PLEASE DON’T LITTER” RARE 1971 REDDY KILOWATT BUTTON. “CONTINENTAL’S BETTER HEALTH INSURANCE” BUTTON WITH SERIAL NUMBER. EARLY AND GRAPHIC ENAMEL ON BRASS LAPEL STUD FOR WORKMAN’S INSURANCE GROUP. “COLT STOP UNION BUSTING” ANTI-COLT FIREARMS UNION CAUSE BUTTON. ANTI-GE “INFACT – COUNT ON ME TO BOYCOTT G.E.” LIGHTBULB/MUSHROOM CLOUD ANTI-NUCLEAR BUTTON. ANTI-GE / ANTI-NUCLEAR WEAPONS “BOYCOTT G.E. STOP NUCEAR WEAPONS” VARIATION BUTTON PAIR. “YOU JUST PAID…” PROBABLY 1950s GAS TAX PROTEST BUTTON. “NATIONAL LEAGUE OF POSTMASTERS OF THE UNTITED STATES” EARLY ASSOCIATION BUTTON. “NOBODY FOR PRESIDENT / NATIONAL WEED” ISSUED BY “HIGH TIMES” MAGAZINE PRO-“GRASS” BUTTON. “EDDIE HEALY MEMORIAL” FALLEN CHICAGO POLICE OFFICER 1937 MEMORIAL BUTTON. “FREE JAMES RICHARDSON AND ALL POLITICAL PRISONERS” FLORIDA FARM WORKER CONVICTED IN 1968 OF MURDERING 1 OF HIS 7 CHILDREN CAUSE BUTTON. FDR “OFFICIAL PIN CELEBRATING THE PRESIDENT’S DIAMOND JUBILEE BIRTHDAY” METAL PIN WITH ENAMEL ACCENTS BUTTON. "CULTER & PROCTOR STOVE CO." BUTTON FROM 1900-1912. "PLANT (PEACE)" VIETNAM WAR PROTEST BUTTON CIRCA 1970. “GREATFUL DEAD” CELLULOID COVERED POCKET MIRROR CIRCA 1980s. HARMAN NURSERIES GENEVA, N.Y. CIRCA 1900 ROSE BUTTON. MULTI-CHARACTER BEAUTIFUL 1930s NEWSPAPER COMIC STRIP PROMOTIONAL BUTTON. “MEMBER TUFFY TOOTH / CAVITY FIGHTERS CLUB” 1969 COLGATE – PALMOLIVE LITHO ADVERTISING BUTTON. "HOUSEHOLD OUTFITTING CO. JUNIOR SALESMAN" CHARMING BUTTON WITH VICTORIAN PARLOR SCENE. FAMOUS TOY MAKER'S CLUB BUTTON C. 1930s. BOYCOTT WAR TOYS 1987 BUTTON FROM THE LEVIN COLLECTION. 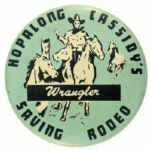 "HOPALONG CASSIDY'S WRANGLER SAVING RODEO" 1950 BANK AWARD BUTTON. WWII U.S. DEFENSE AGENT CLERK’S BUTTON. SATIRICAL ANTI – LBJ “TURN OUT LIGHTBULB – JOHNSON” 1964 BUTTON. "DIARY" WITH SUPERB CELLULOID COVERS FOR 1929. 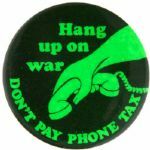 “HANG UP ON WAR / DON’T PAY PHONE TAX” ANTI VIETNAM WAR CIRCA 1971 BUTTON. “HEALTH SPOT SHOES” 1950s CARTOON DOG BUTTON. “DINOSAURS! AT BISHOP MUSEUM” PROMOTIONAL EXHIBIT BUTTON CIRCA 1988. “MUTANTS FOR NUCLEAR POWER” WITH SINGLE EYE SMILEY FACE BUTTON. “ASK ME ABOUT PEPSI COLA” DOUBLE DOT CIRCA 1940 STORE CLERK’S PROMOTIONAL BUTTON. 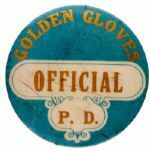 “GOLDEN GLOVES OFFICIAL P.D.” POLICE DEPT. 1930s BOXING BUTTON. "BETSEY JOHNSON" VINTAGE PORTRAIT BUTTON OF FAMOUS FASHION DESIGNER. “ROAR MUTUAL NEWS” RARE RADIO NETWORK BUTTON. FIRST OIL CRISIS 1979 BUTTON. BROOKLYN GUN DEALER CIRCA 1980s GUN RIGHTS BUTTON. NORCROSS GREETING CARDS WWII “V” VICTORY CLASSIC BUTTON. “JOHN J.HOOVER’S SON / CARRIAGE BUILDER” SCARCE AD BUTTON CIRCA 1900. “WORKMAN'S SICK & DEATH BENEFIT FUND" EARLY RIBBON BADGE WITH CELLULOID. "BLUE JAY SCHOOL TABLETS" BUTTON CIRCA 1898. JOHNSON SMITH FAMOUS NOVELTY SUPPLY HOUSE 1930s FUNNY SAYING BUTTON WITH IMAGE. 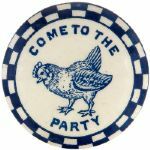 JOHNSON SMITH FAMOUS NOVELTY SUPPLY HOUSE 1930s FUNNY SAYING BUTTON WITH REBUS.